The Huawei Ascend D2 boasts a full HD 5in display, has dust and water resistant capabilities and is equipped with a 13-megapixel camera. However, there's no word if or when it will be released Down Under. Huawei is still building its brand in Australia and has previously focussed on lower-end smartphones at affordable prices. Its latest offering, however, is the Ascend D2 Android phone and it has been designed to compete at the top-end of the market. The Huawei Ascend D2 boasts a full HD 5in display, has dust and water resistant capabilities and is equipped with a 13-megapixel camera. Full HD screens are clearly going to be the number one feature when it comes to smartphone specs in 2013 and the Huawei Ascend D2 doesn't buck this trend. 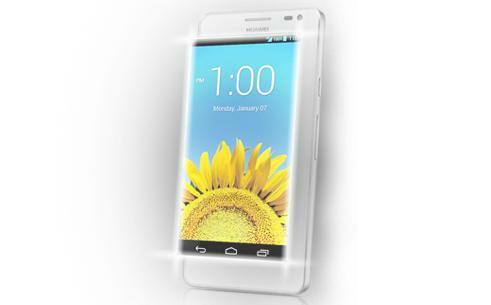 It features a 5in full HD IPS+ screen that boasts a pixel density rating of 443ppi. While the 1920x1080 resolution is set to become a standard feature on flagship smartphones released this year, that doesn't make it any less impressive. Huawei has followed the Sony Xperia Z's lead with the Ascend D2, as the phone is dust and water resistant. Along with a screen that's coated in Gorilla glass, the Ascend D2 should be able to withstand some harsh user treatment. The phone is constructed using a combination of an aluminum body, a metal frame and glossy plastics. Naturally, the ports are covered in flaps to ensure water resistance. The Ascend D2 is both dust and water resistant. 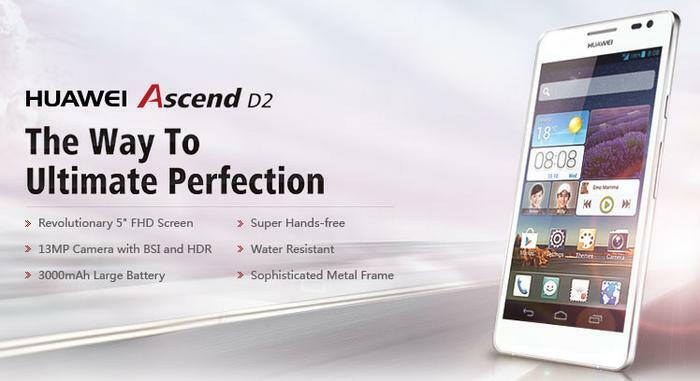 The Ascend D2's 5in screen means it is far from the thinnest or lightest smartphone on the market. It weighs a rather hefty 170g and is 9.9mm thick — by comparison, the Xperia Z weighs less than 150g and is only 7.9mm thick. Huawei says the Ascend D2 will be available in 'pure white' and 'crystal blue' colours. Huawei will launch the Ascend D2 with Android 4.1 (Jelly Bean) but the company is likely to upgrade the phone to the latest 4.2 version in the coming months. Like the larger Ascend Mate, the Ascend D2's software is skinned with Huawei's Emotion UI. There are a few interesting features including a redesigned set of icons and the lack of an applications drawer. Instead, all apps sit either on the home screens or the dock. The Ascend D2 has a 5in display with a full HD resolution of 1920x1080. The Ascend D2 comes with a 3000mAh battery and Huawei says that built-in software automatically turns off the transmitter circuit when data transmission is not in use. According to the company, this reduces power consumption during standby mode by over 20 per cent. In addition, Huawei promises the Ascend D2 can be fully charged in less time than other smartphones, though the company hasn't clarified this claim any further. The Huawei Ascend D2 is powered by the company's own K3V2 1.5 GHz quad-core processor, has 2GB of RAM and comes with 32GB of internal memory. However, there's no microSD card slot for extra storage and no 4G connectivity. Other features include a 13-megapixel rear-facing camera and a 1.3-megapixel front-facing camera for video calls. The Ascend D2 as it appears on the Huawei Web site. The Ascend D2 will go on sale in China later this month but there's been no word yet on if or when it will be officially launched in Australia. A promotional video of the Huawei Ascend D2 can be viewed below.